We’ve already heard from RaVaughn Perkins (77 kg, NYAC, world no. 17) in regards to the impending European tour for the US, which begins this weekend at the 2019 Grand Prix Zagreb Open in Croatia. 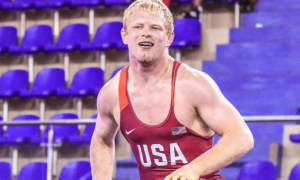 It is a positively stacked American roster that features, in total, five 2018 World Team members (including Perkins) and six other US National Team representatives. 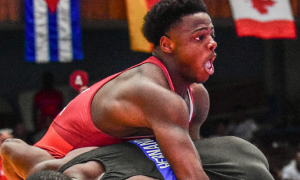 Among the ’18 World Teamers joining Perkins in Europe will be Dalton Roberts (60 kg, NYAC/OTS), Patrick Martinez (87 kg, NYAC), and G’Angelo Hancock (97 kg, Sunkist). 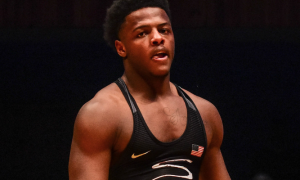 Both Roberts and Hancock last competed at the Dave Schultz Memorial two-plus weeks ago, with the former taking third and the latter sewing up his second title from the event. As for Martinez, Zagreb will offer his first action since the World Championships back in October. All three athletes share similar ambitions and expectations related to the trip, though Croatia will be a first-time experience for Roberts. Martinez is on the opposite end of the spectrum. He competed at the event in ’15, won bronze in ’16, and was on the same tour two years ago — although an injury forced him to sit out. Hancock was also present at the 2017 running of the tournament and finished 1-1. Just before Roberts, Martinez, and Hancock hopped over to the airport, they took a few minutes to answer a few questions about what they were looking to glean from this latest grand excursion for the US Senior program. 5PM: Did Schultz, leading up or coming out, rent any space in your head at all? Dalton Roberts: No, not entirely, no. I was sick at the training camp for a couple of days. It was funny, because they were talking about durability, how our athletes need to be durable even during tough camps, and how if you get beat up you’ve got to bounce back. And they used me as an example throughout the summer. But then Tuesday, Wednesday, and Thursday at a camp, I was sick (laughs). But I don’t know. I’ve got to take something away from it. It’s one of those tournaments that you don’t peak for. I’m not peaking for the Dave Schultz. I’m practicing two times a day leading up to it, and then I got on the mat the day after it. I wasn’t 100%, but I did take a lot away from it. 5PM: You haven’t been to Croatia yet. Is there anything about this one you’re particularly looking forward to, specifically because it’s a new country for you? DR: Yeah, I like seeing different things and getting out. I’m excited for the tournament, too. It’s in the Ranking Series, and those events tend to bring out the best guys in the world, and I want to compete against them. So I’m excited for that. 5PM: You’re also going to Hungary. The Hungarian camp comes with a reputation for its toughness, the live, etc. At this stage of the season with a couple few months before the Trials and all that, do you like the timing of the camps and the back-to-back big events? DR: I do, I do. I’m more free now. I don’t have class and I don’t have a job, so I can travel now. I like the timing of it, it’s one tournament and then a camp, and then another tournament and a camp. As far as Hungary goes, it is now a pretty familiar place to me, and I believe the training camp is the same place we trained at prior to Budapest. I like that place. I like the food, the training environment, the coaches, the Hungarians are tough and everyone else who will be at that camp. All around, I’m 100% excited. 5PM: Does the Zagreb Grand Prix mean something to you? I ask because in 2016, you went here and medaled. Patrick Martinez: Yeah, and I think it was actually my first competition at 85 kilos, 85 back then, 87 now. It was my first time going up. I went up for a little bit in ’16, and then I came back down. I went up and down. 5PM: Does the fact that this tournament brought a medal earlier in your career carry a sentimental value to you, or is this trip just purely business? PM: It’s a business trip, but it’s nice to know where I’m going. I’ve been there two or three times, so it’s not completely foreign to me. It’s business trip, but it is also comfortable. I know what to expect. 5PM: Compare Croatia to somewhere a little more obscure you’ve been to. PM: Zagreb, I’ve been there a couple of times and it’s a smaller city, but a city I am familiar with, and a city I’m excited to go back to and wrestle in once again. 5PM: This is Ranking Series event. Some guys have different feelings about what that means to them. Obviously, this designation raises the level of competition. Do you see these two tournaments, Zagreb and Hungary, as holding more importance than they might normally would have from a competitive standpoint? PM: Oh, yeah. It raises the stakes for me, and it raises the stakes for every other competitor who is going to be there. I think UWW has put more emphasis on these Ranking Series tournaments and it’s going to show here with top-level guys coming to compete, and being ready to compete early in the season. 5PM: It’s the timing of this event for US guys that I keep coming back to, but then again, for a lot of the foreigners, it’s their first time out since Budapest, as well. But in regards to the US, this is different because the scope of competition is less for US guys by and large. Domestically, we only have one tournament outside of the Open and Trials this year. That you’re going away for five weeks, where does that fit for you scheduling-wise? Does this set you up for how you want to peak later in the season? PM: Yeah, I think this heavy competition and training schedule sets it up well. I feel like I am entering this season at a higher level than I did last season. I’m coming in at a higher level, so I am going to reach new peaks this year. I’m excited for that. It’s also going to mesh well with our Pan Ams schedule. Because, we have this month-long trip going on. We’ll come back, then we have a month, a month-and-a-half to train in the US, and we’ll hit the Pan Ams, which has a lot of weight behind it due to qualifying for the Pan Am Games and all of that. So I’m excited, this is great timing for me. 5PM: You also get to spend time in Hungary, I know you enjoy going there. PM: It’s my second home, it feels like. I’m there quite often. 5PM: The camp in Hungary is well-known for how deep the workout partners run, its intensity level. Does that play a big role for you right now, particularly given the phase of the season? Patrick Martinez: Yeah, I’m excited about it, especially for this time of the year, early on in the season. Getting in a lot of live wrestling, a lot of live matches with a good mix of top opponents and competitors, I couldn’t be more excited. The two times I was at this camp previously in my career, I feel like I really benefited from it. I took some big leaps and bounds in my wrestling skills, mindset, and technique, so I’m excited about having another opportunity to train there. 5PM: Getting back into action last week at the tournament following a really busy second half of last year and season as a whole, did you come out of your break feeling refreshed? G’Angelo Hancock: Yeah, I told you how I wanted to take that break and I did. I took about a month, month-and-a-half off and I feel great. You know, I wanted to wrestle for fun, but at first, I didn’t. RaVaughn (Perkins) is actually the one who convinced me. He was like, Man, why don’t you just jump in the tournament for fun? Get some cardio and enter the tournament, especially because those Grand Prixs are coming up. So I did, and I felt really good. I was happy I took that break. I took it until the point when I wanted to wrestle, and that’s what you have to do sometimes. You have to take a break until you miss it. 5PM: Right, so knowing you were going on this trip, that affected your mindset, too? You wanted to feel like you did something? GH: Well, at first it didn’t affect me too much, but then RaVaughn said, Hey, you’re about to wrestle in the Grand Prix, why not get a test tournament in? The Dave Schultz isn’t too renknown of an event, but at the same time, you can still get some experience from it. So I kind of took that into consideration and jumped in there. 5PM: Unlike last year, you’re looking at a consistent full slate of activity. Coming off of 2018 when you didn’t really get going until after the Open, this time around you’re starting with everything — you wrestled in November, already had Schultz, now this trip, and so on. Do you like knowing you’re going to be this busy? Or will you have to reel yourself in here and there? GH: No, definitely, that’s my thing. My favorite thing to be is busy. But for me personally, I’m looking at Croatia as the same thing as the Dave Schultz, as a warm-up tournament. I’m still getting warmed up with Croatia and I am going to use that to get a sense of feel. And then when I go to Hungary I am going to start getting more and more serious, start honing in. Last year was kind of my year overseas for learning, learning, and learning, whereas this year I have a plan. Now this year, I am going to take everything I’ve learned from 2017, 2018 actually, and I am going to illustrate that by putting it into my plan. I know what has to be done and I am going to try my best to work that out. 5PM: RaVaughn has his reasons why he likes going to Hungary, but what about your perspective? Why do US athletes like going to Hungary? GH: Well, in all reality, the reason why everyone likes going to Hungary is because, in short, it’s ridiculous (laughs). Some guys train 20% year-round, these guys train 100% — live. You’re going live in the morning, you’re going live in the afternoon. Hungary is kind of known for their gas tanks. If you’re wrestling a Hungarian, be ready to know that you’re going the distance. You’re better off knowing that you’re going to be wrestling a guy who trains live 24/7. When we go there, you want to get the best possible looks, and as Americans, we’re best known for our conditioning. But when we’re in Hungary, we know that we are going to get pushed by someone who 1) has good technique, and 2) also has great conditioning. They are some of the best looks you can get. We can go the distance with them, but in the long run, we’re also learning technique. 5PM: When you come out of these two tournaments and it becomes the tip of March, do you go back and assess your performances to use them as a baseline for the remainder of the season? G’Angelo Hancock: I’m not really big into watching film, especially matches I lost or just wrestled in. Just because, the way that I like to be coached — and I’ve told this to Mohamed (Abdelfatah) and to (Matt) Lindland — no matter how perfectly I hit a move or how well something is done, I like criticism, no matter what happened. If I hit a move 100% perfectly, I don’t want to hear that. What I want to hear is that there’s something I need to work on. Momir (Petkovic) was the best at this because he was a great psychological coach. He’s really a good coach when it comes to psychological warfare, so it was kind of cool hearing it from him. That’s the way I like to be coached. I don’t like looking back. My coaches tell me the things I need to work on, and then I move forward from there. I’m not looking back at the previous things that happened, I’m moving forward constantly. And the things I am focusing on, I continue to focus on at training camps or everywhere I go from there.